Ergo Cell is an ergonomic pallet lift table designed to work within pallet flow, case-pick applications. Pneumatic controls are used to elevate the front pallet on the lift table creating a comfortable range of motion for order selection, (a.k.a. the Golden Zone), while preventing repetitive injuries and improving picking rates. The Ergo Cell isolates the front pallet while triggering two sets of pop-up pallet separators to hold back the subsequent pallets. This allows for easier case selection and remove of empty pallets without the weight or back pressure of rear pallets. The rear pallets advance only when released by the pneumatic pop-ups are triggered on the control box. The lift table is automatically replenished from the reserve pallets stored in the pallet flow lane. Ergo Cell is a proprietary technology developed by Mallard engineers for high volume fulfillment of heavy cases or cartons picked from pallets. Ideal for beverage, auto parts, hardware and equipment, and more where orders often contain full cartons of a few different SKUs and the product is heavy or cumbersome. Pneumatic pallet separators can be very useful in applications without a lift table as well. Most pallet separators are triggered via an easy to access foot release, but what if you don’t have a foot available… e.g. if you need to release the pallets from a forklift, well that’s where your pneumatic separator can really give you a hand? Leg up? in other words, can be really useful. 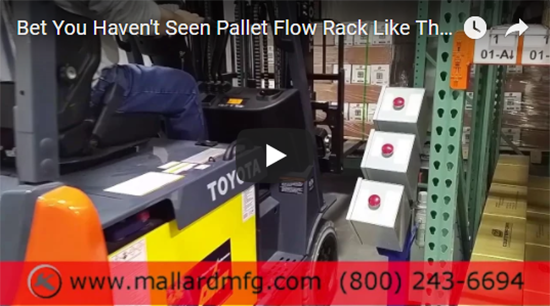 The pneumatic separator can be installed to separate the front pallet for safer removal by a forklift and the driver only has to reach out to the control box to trigger the separator to release. 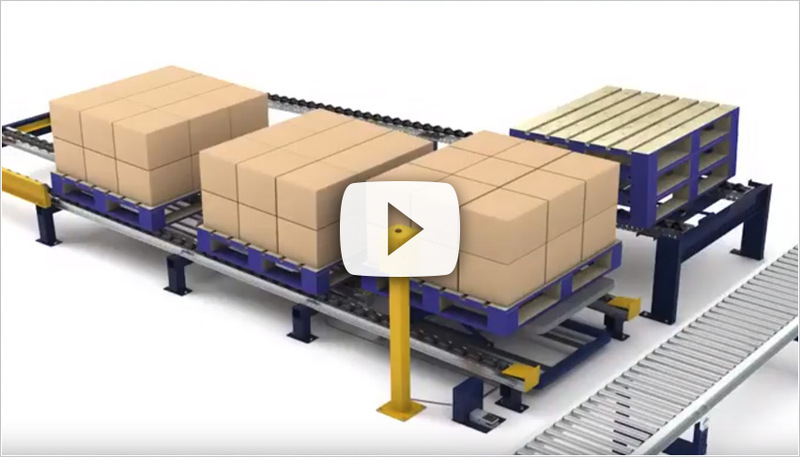 Take a look at a video of a custom application we did for a customer with very limited floor space and heavy pallets weighing-in at 2500 lbs. each. We designed a 12-deep, 3 high pallet flow storage solution that allowed for safe forklift picking, deep lane storage and automatic pick face replenishment all due to a custom designed pneumatic separator control panel. Don’t let your inventory challenges and/or warehousing constraints slow you down, instead, let’s see what some out-of-the-box thinking can do!